I have really enjoyed all of Brad Feld’s books I have read. Venture Deals and Startup Communities were two of my favourites. 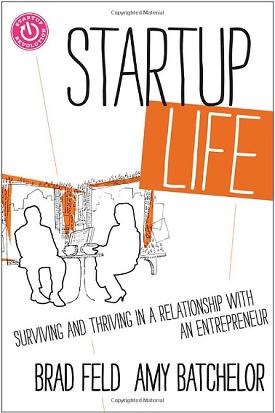 Startup Life co-authored by Brad and his wife Amy was the next instalment in his Startup series. I have really enjoyed all of Brad Feld’s books I have read. Venture Deals and Startup Communities were two of my favourites. Startup Life co-authored by Brad and his wife Amy was the next instalment in his Startup series. For some reason I was a little hesitant to read it. I was not sure I wanted to get the balanced life and relationship advice I thought it would offer. Luckily Brad had a competition a few weeks ago. He offered a dinner with two couples and their partners as the prize. All you had to do to enter was to buy the book and send him proof. I obliged entering for both the amazon and B&N competitions. So when I finished the Founders Dilemma’s, I started to read Startup Life. It turned out to be a really awesome read. Brad and Amy offer some great practical life to help everybody in the family adjust to the pressures of startup life. They’ve also included some advice and inserts from other entrepreneurial couples. Since they don’t have kids, most of the chapters on kids was contributions by others who do have kids. They have a big focus on communication, which forms a central theme throughout the book. They give some great examples from their own relationship on how to work on improving communication. They have some great suggestions like four minutes focused on each other each morning, life dinner and quarterly vacations off the grid. Many of these suggestions came when Amy renegotiated their relationship years into their marriage. I am really glad I read this one. Next step is to get my wife to read it as well. It will definitely help us have a better relationship going forward. Especially as I get ready to do my next startup. Thanks Brad and Amy for going to the effort of writing Startup Life, and being so open in sharing many of your personal thoughts and solutions. I look forward to the next instalment in the Startup series. This entry was posted in Book Reviews, Reviews, Startup Books on 2013/03/01 by Justinus.